When I chose The Mass A Guided Tour by Thomas Richstatter from The Catholic Company to review, my initial thought was that it might be a good reference as we steer Nate toward his First Communion late this Spring. While the boys attend Religious Education through our parish church, we also do quite a bit of supplementing at home. When I began reading this book, I realized that it was probably too much for Nate or Colin, but it was a wonderful book about the Mass for me! I'm a cradle Catholic, but it seems that the last decade have found me at church out of a family obligation to take my children and hope that I could manage to find something for myself while there. I truly believe in the majesty and awe of our Mass, but the distraction of young children have made it hard to recognize that each Sunday. This lovely guided tour of the rich history and meaning behind each piece of Mass was inspiring and informative. Ancient history, as well as modern changes were written about in easy to understand terms, with no judgment. The book helped me connect with the process on a deeper level than I think I ever had. I especially loved how Richstatter compared the service to a symphony in four movements, and carried that imagery through the chapters. 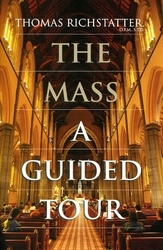 The Mass A Guided Tour is just over 120 pages and each page is full of information and food for thought. I highly recommend the book for adults who wish to know more about our Catholic Mass. And, I believe that even if you are a cradle Catholic, there's always more to learn! You can purchase it from The Catholic Company's website for $12.95. Disclosure: I received a copy of this book from The Catholic Company to facilitate my complete and honest review. No other compensation was provided. Living in the desert, we often struggle with dry skin and dry lips. Mom Central and Neosporin asked if I wanted to try out their new lip products and I couldn't refuse! The Neosporin Lip Health, Daily Hydration Therapy SPF 20 and Neosporin Lip Health, Overnight Renewal Therapy samples arrived the day after we returned from our visit to the Grand Canyon and Flagstaff. Not only were our lips dry, but they were also chapped from the wind and cold in northern Arizona. The Neosporin Lip Health, Overnight Renewal Therapy is thick and goes on easily from the small tub. I slathered it on my lips, as well as all 3 kids, and was pleased with the results in just one night! I had agreed to do a 3-day challenge, so I swiped it on their lips for 3 nights and was very happy that their chapped lips were a thing of the past. I followed up each morning with Neosporin Lip Health, Daily Hydration Therapy SPF 20 on my lips. It provided a nice, moist layer on my lips and for those days that I taught, it helped my lipstick slide over my lips. The boys weren't interested in trying this product, but Lydia was happy to let me put it on her lips. Both products have little to no scent, which I appreciate. They definitely did the job, and I will continue to use them to prevent (or treat) dry lips. You can find more information, as well as download a coupon, at NeoLips.com. Disclosure: "I wrote this review while participating in a blog tour campaign by Mom Central on behalf of Neosporin and received a sample of the Lip Health Overnight Renewal Therapy and the Lip Health Daily Hydration Therapy to facilitate my review and a $20 thank-you gift certificate." When I saw that the Hope For Haiti Now concert was available for download, I downloaded my copy at Amazon. All the proceeds from the downloads will be distributed to a variety of relief organizations helping Haiti -- plus I added some great music to my iPod. If you're looking for a way to help, or another way to help, consider downloading the Hope For Haiti Now set. After almost 7 years, I've decided to purchase a domain name to host this blog. There are a variety of reasons why, but I won't bore you! 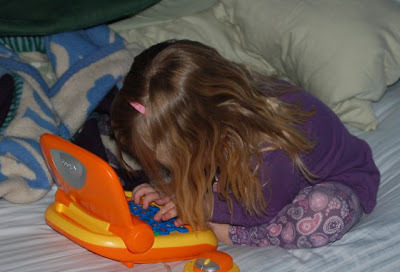 Just know that you'll find me at www.MyLittlePatchOfSunshine.com doing the same thing I've been doing since 2003. You'll be automatically re-directed if you enter the blogspot address, so it probably won't make a difference at all to my readers. One of the reasons it has taken so long to switch away from a blogspot address was that I was hoping to purchase sunshineisfree.com. Unfortunately, the owners of that domain have done nothing with it for years, but weren't interested in giving it up. When I started the blog I was comforted by the fact that sunshine IS free as I was struggling to find my place. I'm also comforted by my little patch of sunshine, and while I'm leaving "sunshine is free" behind, it'll always hold special meaning for me. I can't sing. Not only can't I sing, I don't even have a sense of rhythm. They say children like the sound of their mothers' voices regardless, so I always sang to my children. Each had a few special songs. When Colin was tiny, I would croon "Hush Little Baby" over and over, and I sang a version of B-I-N-G-O except with the letters of his name. I sang "Mama's Little Baby Loves Shortening Bread" to Nate during the many late nights we spent together, as well as "Skin-a-marink-a-do"
Lydia seems to love music more than the boys ever did, and she loves to sing and dance in a much more intense way than the boys. She forces me to stretch the most in my musical abilities, though, because she insists I make up songs on the fly. She'll say "Will you sing to me?" and when I say "yes," she'll say "Ok. Sing a song about pink cupcakes." So, I make up a song about pink cupcakes. And purple cows. And yellow cake. And flying in the sky. She never runs out of song ideas, and always seems pleased with the songs I create. I can't refuse to sing to my young daughter, but I confess I'm glad nobody else hears me sing! I used random.org to choose the winner for Piggy Paint! Comment #4 -- Denise -- was the winner! She has been contacted via email and has 48 hours to contact me for her gift certificate. I want to thank Piggy Paint again for providing me with samples and the gift certificate to give away! As a side note, I had more entries for the last 2 giveaways using Google Forms than I have had for most of my previous giveaways when entries were a public comments. I'm not sure of the psychology behind that, but I'm going to continue using Google Forms for my giveaways! You saw Lydia's toes painted for Wordless Wednesday this week, and I wanted to share with you some information about the nail polish I used. We had the opportunity to try out Piggy Paint nail polish and polish remover, and we were both very happy! A few months ago, a babysitter painted Lydia's nails. She loved it, and asked me many times to paint them again. Between the smell, and all the toxic chemicals, I never wanted to paint her nails. I felt that there are so few things I can truly protect her from, and I didn't want to expose her to yet another potentially dangerous chemical. So, I was excited to try out Piggy Paint! Piggy Paint was created by a mom of 2 little girls who was frightened to see dripped nail polish eat through a Styrofoam plate! She began investigating alternatives, and finally ended up with a product that is non-toxic, non-flammable, all natural and water-based. You wouldn't notice that it wasn't traditional nail polish . . .well, except for the fact that it doesn't have a strong odor! It's thick and colorful and paints on like any other nail polish. Because it is water-based, it can take longer to dry completely, so the website suggests drying it with a hair dryer on cool for a minute or two. This is a product I feel comfortable using with my daughter, and would feel comfortable giving as a gift to other little girls. I can see using Piggy Paint nail polish for many years to come! I would appreciate it if you would tweet about this giveaway, or share it on your Facebook wall as well! You can follow Piggy Paint on Twitter @piggypaint and they also have a fan page on Facebook you can join. Winners will be drawn from valid entries using random.org on Friday, January 22, 2010. If you want more chances to win, visit Moms Love Shopping because I'm also giving away a gift certificate there! Disclosure: I received a bottle of Piggy Paint nail polish and a bottle of Piggy Paint polish remover so that I could do a complete and honest review of the product. Piggy Paint provided the $15 gift certificate to give away to one of my readers. No additional compensation was provided. 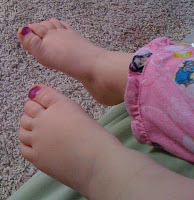 Yes, my Wordless Wednesday shot was of Lydia's toes! Painted with the wonderful Piggy Paint color "Girls Rule" shimmery purple. More about that awesome non-toxic polish in another post -- I want to write about Wednesdays. On Wednesdays, the boys attend an all-day enrichment program. So, that leaves Lydia and me to enjoy our day with each other! Yesterday, that started with our usual early-morning snuggle. I painted her toes (something she's been asking for!) We ate breakfast. I did some work, and she sat next to me, studiously placing gold stickers onto sheets of paper. We read books. We ate some lunch. We headed outside where I pushed her on the swing for 45 minutes. That girl loves to swing and could swing for hours if only someone would push her that long! We came in and she watched some Sprout while I did more work and got some outgrown clothes together to pass along to another mom. Wednesdays are usually quieter and calmer than the rest of the week, since it's just the 2 of us. It's nice, but we're both eager to pick up the boys when the afternoon rolls around. And the first thing she did when they got in the car was show off her purple toes! 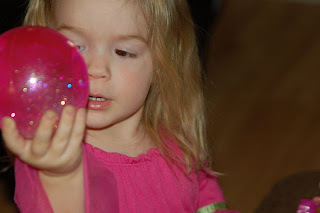 Did you play Wordless Wednesday? Don't forget to tell your story with Tell Me Thursday! 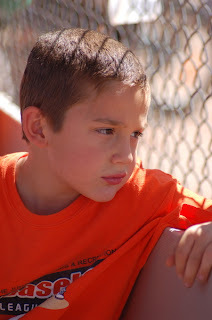 Months ago, I blogged about asking our school district to provide speech therapy for our 7yo, Nate. He has a stutter that improves and worsens over time -- but has never gone away since he was about 3. It took months of evaluations and meetings and bureaucracy, but his actual speech therapy sessions started this week! I am very grateful for the wonderful speech pathologist we are working with. She is kind, knowledgeable and I know she has bent and changed in order to accommodate our odd homeschooling selves. She will meet with Nate twice a week, after the regular school day has ended. Today was our second meeting and I can see that I never would have known enough to help Nate on my own. I appreciate not only her existing knowledge, but that she has the resources to reach out and find the answers to questions she had about his speech disfluencies. As you might imagine, not much has been done. After 2 meetings, Nate has a good understanding of the "speech machine" (Bascially, the diaphragm pushes air from the lungs, into the voicebox to make sound, which pushes it on so that the mouth, teeth, tongue and lips can form words. Over it all, the brain sends messages, which are sometimes misread resulting in a stutter.) I know that Nate understood the mechanics before, but I appreciate her reminder that there is nothing "wrong" and that people who stutter aren't "bad." It just "is"! Today he practiced deep breathing, and I confess I was surprised to see that he didn't expand his belly when breathing in -- but instead pulled it in and then pulled it in farther when he exhaled. Making him more aware of his breaths, and having him practice deep breathing, and belly breathing, will probably help some of his disfluencies. Constricted breathing could possibly affect the air being pushed into the voicebox and cause tightness which could lead to a stutter. 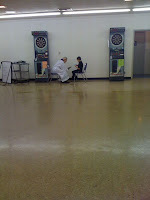 He also practiced mindfully stuttering, and speaking while tense vs. relaxed. The meetings are not stressful for him at all, and Mrs. D helps put him at ease. Personally, I feel she's a bit heavy on the praise, but perhaps I'm a bit light? There aren't any good scientific explanations of "why" people stutter, so much of what I just wrote is conjecture. I'm eager to watch him over the months to see how his increased awareness of his body and his speech help him gain control of his stuttering. I've been thinking about what I want to write about this year, and I've decided I want to write more about our life! Life! I plan to write more about our family life -- how homeschooling works (and doesn't) for us, more about my freelance efforts and my potential job search, fun things we do and challenges we face. Travel! No . . . we haven't found a pile of money hidden in a mattress, but we've made a commitment to exploring more this year. We will be making regular weekend trips as a family - with day trips thrown in as well. I'll write about the places we go, how we find the time, how we do it with a tight budget, and the things we learn. I'm very excited about the adventures we'll have! Recipes! If you know me, you know that Bo does a lot of the cooking. Not because I am unable, it just has worked out that way. I'm going to share more of the yummy things he makes, new things we try, and I'm going to get the kids more involved in the kitchen. And maybe I'll get better at taking pictures of food! Reviews! The reviews and giveaways will continue. Not only do I have fun trying out new things, I love to share them with my readers. I debated about starting a separate review blog, but I personally don't like blogs that are nothing but reviews, so I couldn't see myself starting one. I like to read about people, and their lives, and how they approach life . . . and am interested to read about products they've tried in the context of their lives. So, I'm bucking the trend a bit and leaving my reviews right here mixed in with life! Looking back at 2009, I'm excited about all the neat people and opportunities that opened up to me thanks to this blog. I'm excited about growing it more in 2010 and can't wait to see who I meet this year thanks to this blog! For New Year's Eve this year, we headed to the cheap cinema to take in the movie Cloudy with a Chance of Meatballs , which was amusing. The drama at the end dragged on a bit long for me (and for Lydia) but the animation was amazing and the story cute. Then we used my iPhone's geocaching app and searched for and found(!) 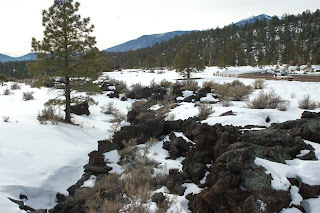 2 geocaches near our home. Geocaching is a great family activity for us, I plan to make sure we do more of it this year. For those curious about what it is, it's a bit like a treasure hunt. People hide caches (sometimes just a paper log to record you found it, sometimes a larger container that holds small trinkets as well as a log) and then record their GPS coordinates and clues at geocaching.com. You can use the free account (which we use) or a paid account (which has more features.) Other than a GPS, you really don't need anything but a sense of adventure and good eyes! I prefer the caches that are hidden in natural settings, don't like the ones that are near traffic (although the 2 we found on NYE were both near traffic), and refuse to search for those hidden at people's homes in their yards. In the past, we've only searched for geocaches, but this year we plan to hide a few of our own. I've put aside some supplies to make that happen, and will update when we've created and hidden our first cache. After geocaching, we headed home -- played some video games and ate a bunch of appetizers for dinner. We rang in the New Year with the boys drinking sparkling grape juice and then sent them off to bed. It was a simple, quiet day and evening -- but fun all the same! I don't feel that goals and resolutions have to wait until January 1 to be set -- I think that you should set new goals as needed throughout your life! But, with the talk of resolutions around this time of year, I have made a few to start out 2010. 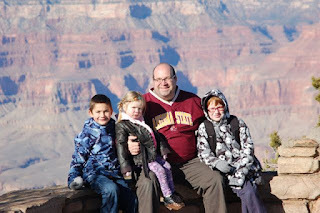 As a family, we talked about what we'd like to do in 2010, and Bo said that he would like to explore more of Arizona. We all agreed that was a great idea, and I've already made plans for our first Arizona 2010 exploration to happen this month! Personally, I'm going to make an effort to finally use the reusable shopping bags I own -- instead of forgetting them in the back of the car like I usually do. In fact, if you want to try along with me -- I may have a giveaway soon to help you skip the plastic bags. And, finally, I want to learn to crochet more than a chain. I love the cute crocheted food I see on etsy.com, and I'd love to make some of my own for Lydia's play kitchen. What about you? What do you hope to achieve in 2010?